Cardinal Charles Maung Bo, Myanmar’s first Catholic Cardinal, at the UK Parliament in London, 25 May, 2016. 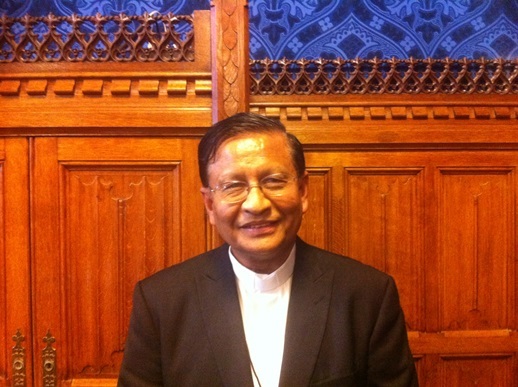 “We desperately need to work to defend rights without discrimination, to establish equal rights for all people in Myanmar, of every ethnicity and religion,” said Cardinal Charles Maung Bo during an address at the UK Parliament in London yesterday (25 May). Cardinal Bo said ongoing ethnic conflict was a “major” and “related” challenge. The military has turned religion into a tool of oppression. Christian crosses have been destroyed and Christians have been forced to construct Buddhist pagodas in their place. Cardinal Bo called on the new government, installed two months ago, to invite the UN’s Special Rapporteur on Freedom of Religion or Belief to visit the country, and warned against a set of new laws introduced by the outgoing government, known as the “Protection of Race and Religion Laws”. He said these laws, which restrict the right to religious conversion and inter-faith marriage, “pose a serious danger for our country”. Cardinal Bo also mentioned the threat of Buddhist nationalism, especially from the extremist “Ma Ba Tha” group, and said he was “deeply concerned” about a section of Mynamar’s Penal Code (Section 295) related to insulting religion. The Cardinal also highlighted the plight of the Rohingya Muslims, whose struggles he called “an appalling scar on the conscience of my country”. 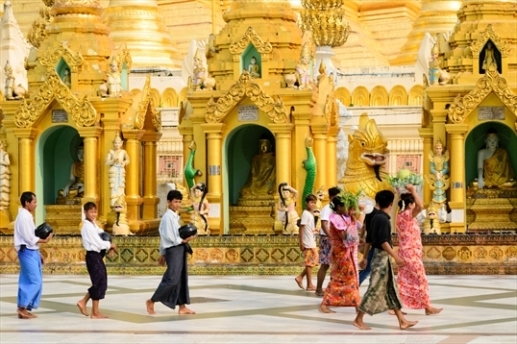 Cardinal Bo said Myanmar is a “rainbow nation … a beautiful country made up of diverse ethnicities and religions”. He said the Catholic Church is representative of this, with followers from many different ethnic groups, and that the Church in Myanmar has long stood beside the marginalised. In conclusion, Cardinal Bo called on the government to reject the new laws on race and religion; to stamp out Myanmar’s drug epidemic and alleviate poverty. No society can be truly democratic, free and peaceful if it does not respect – and even celebrate – political, racial and religious diversity, as well as protect the basic human rights of every single person, regardless of race, religion or gender. He said the government should follow the example of Jesus – “to give ourselves so that others may be free”. “Against the fundamentalisms of hate, we must create a counter-fundamentalism of love,” he said. “My country is emerging from a long night of tears and sadness into a new dawn. After suffering crucifixion as a nation, we are beginning our resurrection. But our young democracy is fragile, and human rights continue to be abused and violated. “We are a wounded nation, a bleeding nation. For ethnic and religious minorities, this is particularly true, and that is why I conclude by emphasising that no society can be truly democratic, free and peaceful if it does not respect – and even celebrate – political, racial and religious diversity, as well as protect the basic human rights of every single person, regardless of race, religion or gender. “We are a rainbow nation, a nation of many different ethnicities, cultures, languages and religions. That is its beauty and it is something to be protected, defended, cherished and strengthened.